Water scarcity is an ongoing, global problem that is predicted to affect two-thirds of the world's population by 2025. While we do our part in conserving water by taking shorter showers or adjusting the sprinkler system, we don’t often think about our driveways. But impervious pavements all throughout our urban areas are a major factor in worsening water scarcity. It not only stops water from reaching the soil underneath, it collects pollutants and precipitation that gets drained into our waterways when it does rain. Instead of returning to the area’s groundwater supply by soaking into the soil, stormwater picks up the pollutants and hits our waterways causing erosion and flooding. Naturally, one of the best ways to reduce surface run-off is to reduce the amount of impermeable surface area in your environment. Concrete driveways, walkways, decks, and so on are a major culprit in creating surface run-off. Fortunately, there's an easy way to cut back on those impermeable surfaces: switch to porous paving instead. Porous paving is a paving material that allows water to penetrate and sink into the soil, instead of causing it to bounce off. All porous paving systems consist of a subgrade, a base course, and a surface course. The subgrade serves as the foundation for the paving system; it consists of a level soil surface. The base course is a layer of roadbase. Finally, the surface course is the porous paving material itself. While a number of porous paving options exist, it's important to choose your specific product carefully. Some of these products have high maintenance requirements or break down after a relatively short period. To have a green alternative to concrete is the best decision for your business or home. At StoneSet, we believe in porous paving of the highest quality and durability. 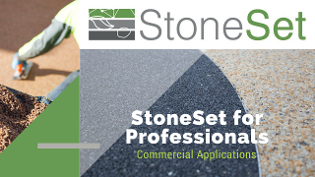 When properly installed, StoneSet comes with a 10-year guarantee, and is able to remain quite low-maintenance. Find out more about how you can spend more time enjoying your property while doing your part for the environment by contacting us!